This will be my last entry for this year.. this year?? haishh it feels like yesterday that i wished everyone a Happy New Year..
Year 2011 in particular has been pretty challenging for me.. the year where i started my online store.. the year that i started taking orders again (after not doing so for 10 years).. a year that saw a lot more laughter in my family .. a year that gave me the opportunity to get to know alot more ppl than during my schooling times.. a year that my hubs had to be hospitalised... my dear son having two bike accidents.. and at the same time a year of a few disappointments.. i am not gonna dwell abt the disappointments cos really.. they are not worth a second of my thoughts.. what matter most is that I know by now who is who..who is sincere and who is not..
What is ur new year resolution?? same like last year?? hehe... me too! bake more?? hehe certainly! I dont think i will ever stop? the urge to keep on trying new recipes is like a burning fire.. I am so looking forward to next month cos hb said he has a surprise for me and it involves baking.. hmmm cant wait! This Opera Cheesecake will be my last bake for this year.. err not really cos tmrw morning i hv to bake lapis legit prune for an order but yeah.. basically this cake is my last bake for my family.. it took me a total of 4hrs to get it done and lemme warn u.. this cake has a lot of steps that u need to follow carefully.. follow the steps properly and i am pretty sure u will get it right.. The Joconde Sponge Cake recipe is adapted from Dalloyau from Paris Sweets: Great Desserts from the City's Best Pastry Shops by Dorie Greenspan (Broadway Books, 2002) and the cream cheese layer recipe is fm a book called Cheesecake Seduction by Catherine Lau which i bought like 4yrs ago.. combined them together and i got a yummylicious Opera Cheesecake..
1. Position the racks to divide the oven into thirds and preheat the oven to 425 degrees F (220 degrees C). Line two 12 1/2-x15 1/2-inch (31-x-39-cm) jelly-roll pans with parchment paper and brush with melted butter. (This is in addition to the quantity in the ingredient list.) - i used one 40x30cm pan and bake it at 200C for 8 mins. 2. Working in a clean dry mixer bowl fitted with the whisk attachment, beat the egg whites until they form soft peaks. Add the granulated sugar and beat until the peaks are stiff and glossy. If you do not have another mixer bowl, gently scrape the whites into another bowl. 3. In a mixer fitted with the paddle attachment, beat the almonds, confectioners sugar and whole eggs on medium speed until light and voluminous, about 3 minutes. Add the flour and beat on low speed only until it disappears. Using a rubber spatula, gently fold the meringue into the almond mixture, then fold in the melted butter. Divide the batter between the pans and spread it evenly to cover the entire surface of each pan. Put the chocolate in a medium bowl and keep it close at hand. Bring the milk and cream to a full boil, pour it over the chocolate, wait 1 minute, then stir gently until the ganache is smooth and glossy. Bring the butter to a boil in a small saucepan. Remove the pan from the heat and clarify the butter by spooning off the top foam and pouring the clear yellow butter into a small bowl; discard the milky residue. Melt the chocolate in a bowl over—not touching—simmering water, then stir in the clarified butter - i used ganache for the topping. Bring milk and half the sugar to the boil. Remove fm heat. Set aside. Beat egg yolks till foamy. Pour in hot milk mixture while stirring. Whisk over simmering water till thick and smooth. Stir in coffee mixture. Remove fm heat. Mix in gelatine mixture. Leave to cool. Beat egg whites until foamy. Add remaining sugar and heat till stiff. Set aside. Bring syrup to boil. Pour onto beaten egg whites while beating. Mix until mixture has cooled. Set aside. Beat cream cheese till smooth. Stir in egg yolk mixture. Blend in thickened cream. Fold in egg white mixture. Set aside. Heat remaining ganache and pour onto cakes. Leave to set at room temp. Cover and refrigerate overnight. Remove cakes fm pans and peel off plastic sheet. Decorate as desired bef serving. Lift the chilled cake off the parchment-lined pan and place it on a rack. Put the rack over the parchment-lined pan and pour over the glaze, using a long offset spatula to help smooth it evenly across the top. Slide the cake into the refrigerator to set the glaze and chill the cake, which should be served slightly chilled. At serving time, use a long thin knife, dipped in hot water and wiped dry, to carefully trim the sides of the cake so that the drips of glaze are removed and the layers revealed. Note: will only make half of the filling recipe if i am using 7" cake ring. Pheeww finally am done! hehe.. do bake it if u feel like challenging urself cos its worth the effort.. ty Rossyn for the macs, apple pie, chocolate caramel cheesecake and also fudgy brownies order.. hope u girls have a wonderful time tmrw.. to Ima .. ty for the macs order.. dont forget to sms me ok and ty Latiffah who will be my first customer in 2012 for the lapis legit prunes order.. HAPPY NEW YEAR!!! ALL THE BEST FOR 2012! goodness me!! panjang berjela that recipe & method babe!I can tell it's sinfully delicioso..now u know why 2011 dah nak end, that opera cake tak menjelma @ easybakes..hehe...kesian dude..takut gak ai dia terkempunan BBBB.. HAPPY NEW YEAR to u and ur family too!! nyanyi?? kahkahkah.. i can only imagine.. besok whatever we do.. will be the last one in 2011.. hope u will hv a good year ahead of u yah..
Salam Rima,cantik kek ni and terliur dibuatnya....tak boleh nak try this one bcos I've already cleared my pantry...maybe when everything settle down nanti,knur can start baking again. Ok,wishing you all the best for 2012 and many many years to come...hopefully dpt jumpa nanti ya..
sinfully delicious! i can literally smell the coffee from my abode. 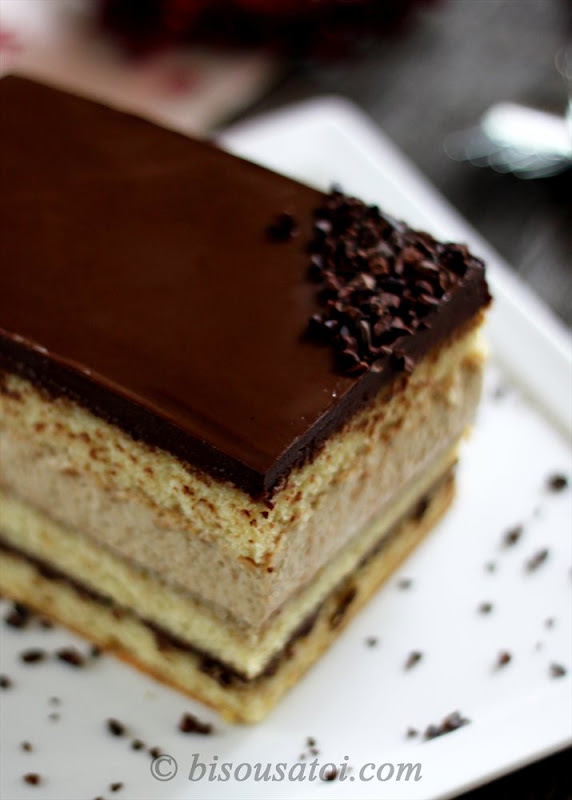 i got try this recipe soon, cos i could not find a decent opera cake in kl. frustrating betul la babe. oh ya, manage to catch up on ur past entries. looks like i missed ur b'day, so here's the belated birthday wish from me "semoga panjang umur & murah rezeki". p/s: when will u be flying to france? i might be there in Jan to replace my boss for a mtg - plus few EU countries as well. mana tau kot bole jumpa kat sana nnti. Yes u can.. percaya lah that bau kopi dah sampai kat rumah u hehe.. bake it ok cos memang sedap.. diff fm the last two opera that i dah baked.. Happy new year to u too! am so glad to hear that u hv tried some of the recipes in my blog.. happy baking! Happy New Year to u and ur family too Rinar! Belum tido lagi?? ishhhh holiday mood kah? hehe.. bake it if u hv the time ok.. the filling tu better to add more gelatine cos its a little wobbly but kan lepas letak kat freezer dia ok ajer.. maybe u can add 1/2 or 1 tbsp more of powdered gelatine. Not been to Totts for a while.. the last time i went there cuma beli their cuppies paper and also their cute mute gift box.. Happy New Year to u and ur family too.. hope its gonna be a good year to all of us! Memang terasa nak nangis tengok kek opera tu. Takperlah, with my imaginasi yang agak liar nih, biarlah I concoct sendiwi apa rasanya kek opera itew *sambil celup crackers dlm neskepe*. Waduh kak rima..Naz baru memasang hajat nak buat opera cake first version akak tuh today..sekali keluar version baru plak...makin meleleh air liur!!! hahaha..happy new year to you kak rima n family!! Happy New Year to you and your family. May you have a blessed 2012. Love all your wonderful and beautiful bakings. Happy new year to u too! Thanks for blogging, i love reading all yr posts! wishing you and your family a Happy New Year!!!! just pilih yg mana satu menjadi idaman mu and then bake it.. sure can jadi one.. just follow the steps properly ok.. Happy new year to u too.. ty for trying some of the recipes in my blog .. Thank you Sally.. hv a blessed 2012 yah..
Ty dear.. hv a wonderful year ahead! Ty Edi! i love urs too.. hv a blessed one ok..
To u too! hv a blessed one! Ty for the wish.. have a good one ok! Here wishing you Happy New Year 2012 and may happiness always be with you and family...Semoga semakin mengancam baking2 nnt ya Rima...akak jek dah x rajin nih...hehee...Glad knowing such a lovely woman like you! ^____^ muaaahhh! 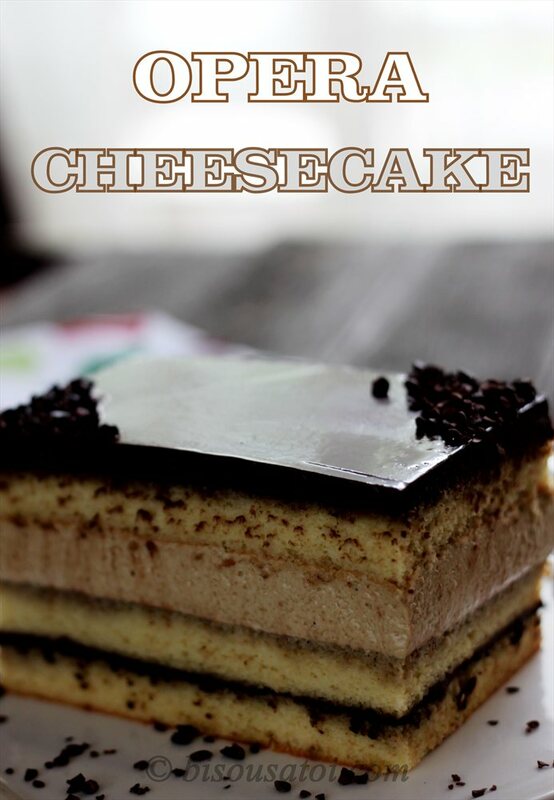 This is so tempting, I wanted to make Opera cake , and I must make in New year. Happy 2012! adei jgn lah tak rajin.. harus merajin kan diri cos harus ade new entry baru shiok.. keep on blogging wokey cos cos u hv to!! hehe happy new year to u and ur family.. hv a wonderful one! u hv to.. die die must try and bake one ok hehe.. hv a blast year ahead! Happy new year to u too.. sasha masih ader.. shes been with us dari dia berumur 3 wks.. now shes been with us close to 7yrs dah..
Aduh terliur kami dibuatnya. Kalau suruh saya yg buat, confirm tak menjadi. Just wanna wish you 'Happy New Year 2012'.. Looking forward more yummy posts from you in 2012.. 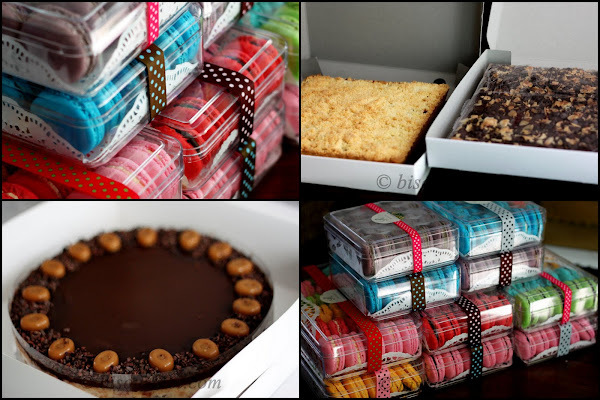 The cake and the boxed goodies look so gorgeous! Happy New Year to you, Rima! Happy New Year 2012 to you too dear! 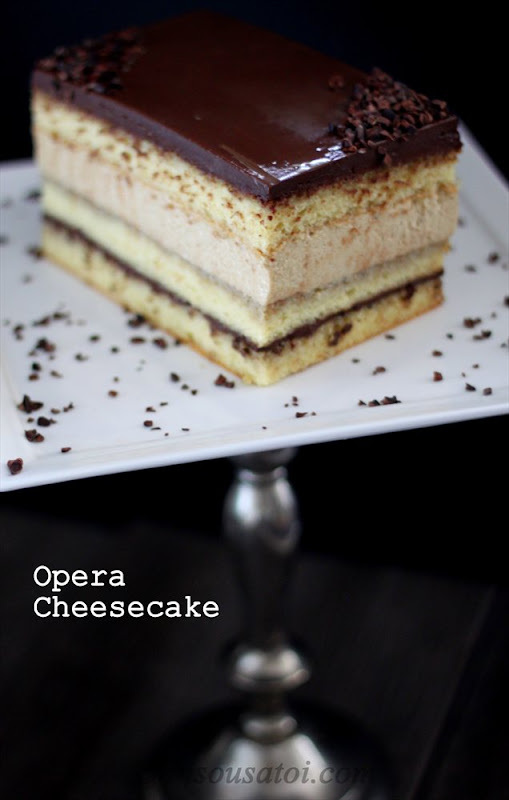 This Opera Cheesecake look delicious and appetizing; but I think it must be tedious to make by the look for the layers of it. Was it? Happy New Year to you too. Really amazed by yr energy & talent!Looking forward to more gorgeous & witty posts in 2012! Happy New year to u and family too! Alhamdullilah.. stay healthy and eat wisely.. cheeeeebahhhh hahaha.. happy new year to u and family too! bila nak datang melaka lagi? nak order kek ni dari kak rima je lah.. mencabar nak buat! Happy new year kak rima! Love dat opera cake! but tengok recipe macam paham tak paham gitew.. hehehheh. Macam susah nyer nak buat kak! Happy New Year to you & family!! Opera kek, waduh..sedapnya!! bilalah dapat buat ni ya..banyak entry yang i terlepas..oops I missed your birthday.. Happy belated birthday to you juga ya..semuga panjang usia, murah rezeki dan berbahagia disamping keluarga tercinta..
Insyallah.. u email me ur order and i will notify u when i am driving up again.. tks! hehe if tak faham sangat u can always email me ur question.. insyallah i will be able to help u along the way.. happy new year dear! ahhhh orang Korea dah mai hehe.. tadi i went to ur house but baru hap way baca si sonia nak susu pulak.. wait i come again ok.. Happy new year to u and ur family too! Dear Rima, your cake looks beautiful as always! You're so creative to combine the 2 recipes together! It looks like a lot of work, but from the pictures I can see that it's all worth the work! Happy new year to you and your family! First of.. happy new year to u dear! honestly?? it wasnt too bad.. am pretty sure u can do it too..
Nice job on the strawberry shortcake! tks for trying! If u follow the steps sure akan jadi.. must hv confidence ok..